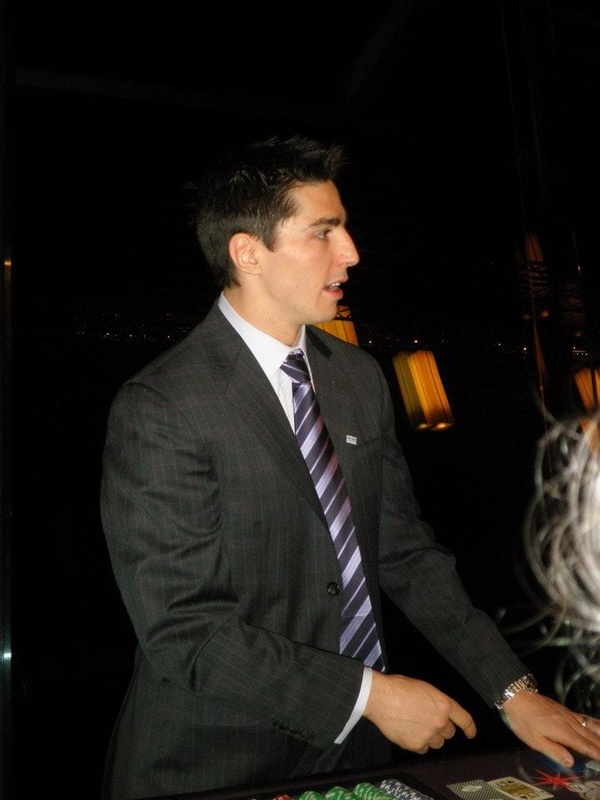 Alex Burrows running the blackjack table. I was fortunate enough to attend the annual Vancouver Canucks Dice and Ice fundraiser dinner this past week. It is an event that I have wanted to attend since I was a child. The whole team is in attendance for a casino and auction gala and the players work all the casino tables. You can play roulette with Jannik Hansen, poker with Kevin Bieksa and blackjack with Cody Hodgson (who, by the way, would put Vegas out of business). The purpose of the entire evening is to raise money for the Canucks for Kids Fund which oversees the Canucks Autism Network and the Canuck Place Children’s Hospice. As obvious a statement as the event was for class structure and neoliberal citizenship, it was also a more subtle statement in the heteronormative culture of professional hockey. During the event I was too much the kid in the candy store to really have a critical eye for anything (but I did notice all the older white people, that was pretty blatant). On the ride home I was flipping through the auction catalogue and that’s where my “hmmm” thoughts came into play. One section of the silent auction items were categorized under “Player Family Baskets”. These baskets were put together by a number of players and the coaching staff with whatever items they wanted to include. Raymond’s basket was full of his family’s favourite foods, the Hansen family put together a Wii basket and Henrik Sedin’s family contributed an equestrian basket (because how many of us wouldn’t want an equestrian basket!). As I was flipping through the pages reading about all the cool stuff I didn’t get to take home I realized what a subtle, yet powerful, statement of heterosexual family values I had at my fingertips. Each basket listed “Kindly Donated by: Keith and Jamie Ballard, Henrik and Johanna Sedin, Andrew and Maggie Ebbett, Ryan and Andrea Kesler” etc. etc. etc. Even the players without wives were still considered families and listed with their girlfriends/partners (e.g., Jannik Hansen and Karen Derkson, Alexander Edler and Amanda Lombardo). Now, this is obviously nothing new – we like our sports heros to be “manly” men with slender, attractive women on their arms, but the interesting part is that any overt chance to parade each player’s heterosexuality was avoided. The players wives and girlfriends were not paraded out on stage, they were not announced publicly, they were not shown on the big screens like they do at the Academy Awards. Sure, Mason Raymond could be spotted walking around with his girlfriend but it could have been just as easy to have no idea that his girlfriend was even in attendance. Hence, I found these “family” baskets even more significant in there subtlety. A very sly way of saying, “no gays here”. The Canucks could have chosen to list each basket under the player’s name only, thus also allowing single players to be included (e.g. Hodgson family basket – obviously – donated by Hodgson family); but, they went so far as to list names of their significant others. I recently blogged about MLB player, Billy Beane, and how major league athletes still claim, in large part, to consider themselves neanderthals when it comes to homosexuals in professional sports. With still no openly gay players in the NHL, which either speaks to a phenomenal statistical aberration or an extremely homophobic environment, this simple auction catalogue simply reinforced to me how far the NHL has to go when it comes to issues of sexuality. The NHL’s “Hockey is for Everyone” campaign is specifically targeted at making hockey accessible to those from different racial and socio-economic backgrounds; but, perhaps more attention needs to be directed at making hockey accepting of everyone that is currently involved. As it stands, well into the twenty-first century, hockey continues to be for heteros and homosexuals need not apply. ← Weekly Links: Gender Disparities in Media Coverage of Hockey Injuries; Winter Classic Alumni Game Participants Don’t Get Paid; Are the Montreal Canadiens Still Relevant? How you can hijack a charity event to and turn it around to basically gay bashing is beyond me. I’m as sympathetic to gays as the next person but you’re really, really reaching on this one. You’re basically being offended because they listed the player’s significant others on the name of the basket. Have you stopped to consider that maybe they did that because the family had input on the basket and it was supposed to be a meaningful gift and give auctioners a chance to take home a slice of the player’s personal life? Why can’t it simply be recognizing the fact that not only did Jannik Hansen had input on the basket, but so did his girlfriend? Why can’t the act of offering a gift up for auctioning for charity be a kind act that involves the entire family, not just the player? You’re also counting your eggs before they hatch because you’re insinuating that if there was an openly gay player on the Canucks, that they wouldn’t name the basket “Mike and Dan Family”. You don’t know that and to assume the world is conspiring against your beliefs is precisely the attitude that leads good people to over analyze a simple charity event. Please leave both your feet on the ground and talk about things that actually matter. There’s a lot that can be said on homosexuality in professional sports but next time you write on the topic, leave your tin foil hat under the bed. By the way, the Sedins are harcore in to horse racing in Sweden, thus the equestrian basket. As well, since the event is obviously aimed at Vancouver’s wealthy, I’m sure there’s atleast one old, rich white dude that owns a horse attending the event. I don’t think that offended is the appropriate word. I was merely offering an observation, of which you clearly disagree. I agree with you on the purpose of the basket – “the family had input on the basket and it was supposed to be a meaningful gift and give auctioners a chance to take home a slice of the player’s personal life” – that is the obvious statement, but what that “family basket” represents to me is one card in a house of political statements about sport and masculinity. The whole evening itself is a celebration of individual philanthropy over state social welfare, which I could have written about, but I found that the subtle interjection of heteronormative family values rather intriguing. Whether or not the Canucks organization would include a “Mike and Dan” family basket is irrelevant at this point because there are no openly gay players, which is the larger issue at hand. It does not matter what they might do to support a player, it is the fact that no player in the entire league feels comfortable enough in his sport to be openly gay. Am I being overly sensitive about these charity baskets? Quite possibly. But in my mind these baskets are exactly the same as when the media show the boyfriends of female tennis players in the stands. Maybe they are just providing fans a glimpse into their favourite players lives, but the media certainly understands which glimpses help fight the notion that all female athletes are lesbians or unfeminine at the least. The true art of power is when it has become so normalized that no one questions it. * I am well aware of the Sedins and their horses. My poke at the equestrian basket (as you alluded to) was one of class and not of randomness.